Tested.com was talking about this. I want to check it out. What did they mess up? Tyler wrote: What did they mess up? You'll have to watch to find out! the company that held exclusive rights to all star wars toys failed to meet their end of the contract which would have kept their lifelong rights in place. 5% royalty fee forever. They only had to guarantee $10,000 in royalties a year or the contract would expire. They could have written a check for the amount. They did not pay the royalty for a few years while star wars was dormant and they lost exclusivity and now pay 15% royalties or more. I watched. I can't believe so many companies passed and the first Star Wars toy didn't come out until a year after the first movie. Also foolish they didn't keep paying lucasfilm the $10k a year during slow years. They should have had someone in charge of that so they could keep their 95% share of every dollar. I think it went up to 18% after the 5% went away. 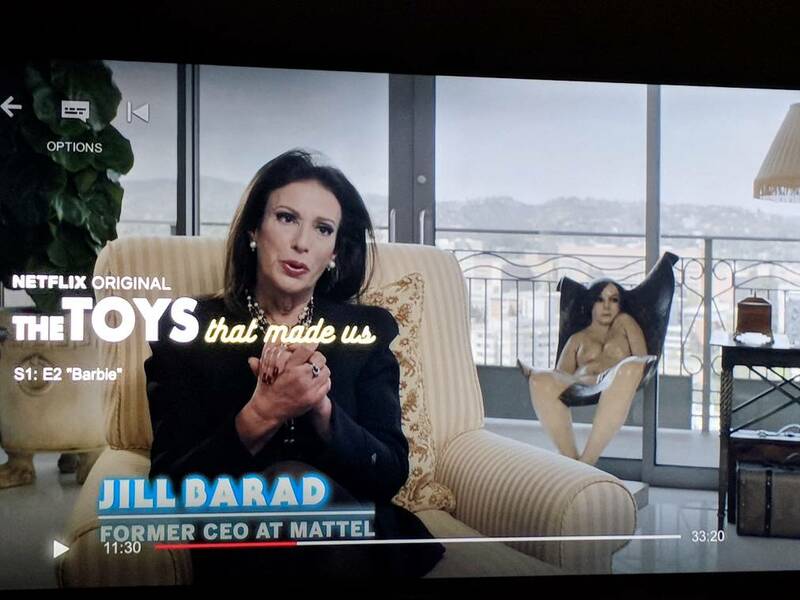 What is that creature sitting behind Jill Barad in the Barbie episode. Kath525 wrote: What is that creature sitting behind Jill Barad in the Barbie episode. Did you see it in the episode or YT trailer? Gotcha. I haven't seen the Barbie one yet. Are you watching out of order?!?! "haven't seen it or the trailer"
This is the thing of nightmares! I started the episode forgetting the person you had said to look behind but I couldn't avoid seeing this and screaming. Jocelyn looked it up. It's some fancy sculpture. 3 ever made. Watching the He-Man one now, episode 3. I have no feelings towards He-Man, but I still find this fascinating. This is a great series. He-Man was the first toy to have a TV show, and it was started when a marketing guy lied and told Toys R Us that the toy line would have a cartoon attached to it. There was never a conversation to have this show and they had to scramble to do it after he liked about it. Watching the GI Joe one now. They had to cut cost and remove 10% of every character. Instead they decided to just cut almost all of the details/color out of one character... Snake Eyes. The black ninja dude. I don't remember GI Joe making Kenner sized toys either. I only know of them as foot tall toys. Pumped for next half and season 2! This show is very well done, so well done that I will even watch the Hello Kitty episode.